Our Cliff House is a single story cedar cabin located on a 50-foot bluff above the Paluxy river with a breath taking view from the deck and hot tub. It is decorated with a hunting style decor with an open living, dining, kitchen, bath concept with shower stall only. There is a full kitchen with range/oven, microwave, large refrigerator, coffee maker with coffee, pots, pans, dishes, towels, and linens. The cabin had a king size bed, two rocking chairs, AM/FM/CD player, heat and air and dining table. Chairs are located on your deck with your propane grill. 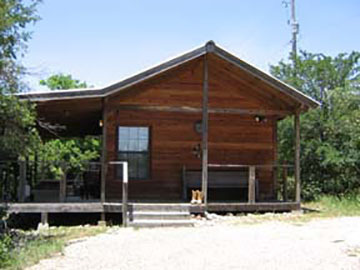 This cabin does NOT have access to the river, but is the most removed from all of the other cabins.